The long-term vision of this project is to provide methods that enable the development of resource- aware applications for data analysis in potentially distributed cyber-physical systems (CPSs). For that purpose, the project systematically captures the resource demands of distributed and compound platforms to develop resource models that provide this information during design or runtime to the developer, or to the respective data analysis application of the system software. In addition, the project’s achievements serve other CRC projects in the following two ways: First, application of state of the art machine learning approaches for synthesis of such models and second, the provision of these models for efficient data analysis on resource constrained devices. The third project phase shifts the focus of the research from homogeneous system platforms to the topical subject of large-scale, heterogeneous and energy-constrained internet of things (IoT)-networks. Important and new research topics address a resource-optimised segmentation of network-wide data analysis tasks according to available energy resources and individual platform features, as well as a guaranteed power supply by parallel energy harvesting in dynamically changing environments, e.g., distributed logistic systems. Our achievements of indoor photovoltaic harvesting will be extended to different harvesting principles. In addition, hardware and methods for optimised multi-source energy scavenging on a single device have to be developed and modelled. The research will focus on methods that support data analysis application developers during design and development of such systems with mandatory model-knowledge, algorithms for segmentation of tasks, and the corresponding platform services. The project will also face the emerging challenge of overcoming the capacity limits of the involved massive machine type communication (mMTC) in ultra dense environments. For this purpose, we will extend and validate methods of the newest 4G/5G technologies, e.g., NB-IoT and mmWave pencil beams, by our novel methods for data- analysis-based resource prediction and positioning. It will be combined with the elaboration of multimodal indoor positioning and localisation systems together with methodologies for reference matching and data aggregation in graph based representations of network entities. Simulations and predictions of resource-demands in distributed scenarios should reveal the validity and feasibility of the considered approaches and solutions. Buschhoff/etal/2018a Buschhoff, Markus and Falkenberg, Robert and Spinczyk, Olaf. Energy-Aware Device Drivers for Embedded Operating Systems. In SIGBED Review, 2018. Buschhoff/etal/2018b Buschhoff, Markus and Friesel, Daniel and Spinczyk, Olaf. Energy Models in the Loop. In 9th International Conference on Ambient Systems, Networks and Technologies, ANT-2018 and the 7th International Conference on Sustainable Energy Information Technology, SEIT 2018, Vol. 130, pages 1063 - 1068, Elsevier, 2018. Falkenberg/etal/2018a Robert Falkenberg and Jens Drenhaus and Benjamin Sliwa and Christian Wietfeld. System-in-the-loop Design Space Exploration for Efficient Communication in Large-scale IoT-based Warehouse Systems. In 2018 Annual IEEE International Systems Conference (SysCon), Vancouver, Canada, IEEE, 2018. Falkenberg/etal/2018b Robert Falkenberg and Benjamin Sliwa and Nico Piatkowski and Christian Wietfeld. Machine Learning Based Uplink Transmission Power Prediction for LTE and Upcoming 5G Networks using Passive Downlink Indicators. In 2018 IEEE 88th IEEE Vehicular Technology Conference (VTC-Fall), Chicago, USA, 2018. Heimann/etal/2018a Heimann, Karsten and Tiemann, Janis and Böcker, Stefan and Wietfeld, Christian. On the Potential of 5G mmWave Pencil Beam Antennas for UAV Communications: An Experimental Evaluation. In 22nd International ITG Workshop on Smart Antennas (WSA 2018), 2018. Liedmann/etal/2018a Florian Liedmann and Christoph Holewa and Christian Wietfeld. The Radio Field as a Sensor - a Segmentation Based Soil Moisture Sensing Approach. In 2018 IEEE Sensors Applications Symposium, IEEE, Seoul, Korea, 2018.
masoudinejad/etal/2018a Masoudinejad, Mojtaba and Magno, Michele and Benini, Luca and ten Hompel, Michael. Average Modelling of State-of-the-Art Ultra-low Power Energy Harvesting Converter IC. In International Symposium on Power Electronics, Electrical Drives, Automation and Motion (accepted for presentation), 2018.
masoudinejad/etal/2018b Masoudinejad, Mojtaba and Venkatapathy Ramachandran , Karthik Aswin and Tondorf, David and Heinrich, Danny and Falkenberg, Robert and Buschhoff, Markus. Machine Learning Based Indoor Localisation using Environmental data in PhyNetLab Warehouse. 2018. Sliwa/etal/2018a Sliwa, Benjamin and Liebig, Thomas and Falkenberg, Robert and Pillmann, Johannes and Wietfeld, Christian. Efficient machine-type communication using multi-metric context-awareness for cars used as mobile sensors in upcoming 5G networks. In Proceedings of the 87th Vehicular Technology Conference: VTC2018-Spring, IEEE, 2018. Sliwa/etal/2018c Benjamin Sliwa and Thomas Liebig and Robert Falkenberg and Johannes Pillmann and Christian Wietfeld. Machine learning based context-predictive car-to-cloud communication using multi-layer connectivity maps for upcoming 5G networks. In 2018 IEEE 88th IEEE Vehicular Technology Conference (VTC-Fall), Chicago, USA, 2018. Sliwa/etal/2018d Benjamin Sliwa and Thomas Liebig and Robert Falkenberg and Johannes Pillmann and Christian Wietfeld. Resource-efficient transmission of vehicular sensor data using context-aware communication. In 19th IEEE International Conference on Mobile Data Management (MDM), Aalborg, Denmark, 2018. Behnke/etal/2017a Daniel Behnke and Matthias Priebe and Sebastian Rohde and Karsten Heimann and Christian Wietfeld. ScalaNC - Scalable heterogeneous link aggregation enabled by Network Coding. In 13th IEEE International Conference on Wireless and Mobile Computing, Networking and Communications (WiMob 2017) - Fourth International Workshop on Emergency Networks for Public Protection and Disaster Relief (EN4PPDR'17), 2017. Buschhoff/etal/2017a Kerrison, Steve and Buschhoff, Markus and Nunez-Yanez, Jose and Eder, Kerstin. Measuring Energy. In Fagas, Giorgos and Gammaitoni, Luca and Gallagher, John P. and Paul, Douglas J. (editors), ICT - Energy Concepts for Energy Efficiency and Sustainability, InTech, 2017. Falkenberg/etal/2017a Falkenberg, Robert and Sliwa, Benjamin and Wietfeld, Christian. Rushing Full Speed with LTE-Advanced is Economical - A Power Consumption Analysis. In IEEE Vehicular Technology Conference (VTC-Spring), pages 1-7, 2017. Falkenberg/etal/2017b Falkenberg, Robert and Masoudinejad, Mojtaba and Buschhoff, Markus and Ramachandran Venkatapathy, Aswin Karthik and Friesel, Daniel and ten Hompel, Michael and Spinczyk, Olaf and Wietfeld, Christian. PhyNetLab: An IoT-based warehouse testbed. In 2017 Federated Conference on Computer Science and Information Systems (FedCSIS), 2017. Falkenberg/etal/2017c Falkenberg, Robert and Heimann, Karsten and Wietfeld, Christian. Discover Your Competition in LTE: Client-Based Passive Data Rate Prediction by Machine Learning. In IEEE Globecom, pages 1-7, Singapore, 2017. Friesel/etal/2017a Friesel, Daniel and Buschhoff, Markus and Spinczyk, Olaf. Annotations in Operating Systems with Custom AspectC++ Attributes. In Proceedings of the 9th Workshop on Programming Languages and Operating Systems, pages 36--42, New York, NY, USA, ACM, 2017. Masoudinejad/2017a Masoudinejad, Mojtaba. A Power Model for DC-DC Boost Converters Operating in PFM Mode. TU Dortmund University, 2017. Masoudinejad/2017b Masoudinejad, Mojtaba. Automated Data Collection for Modelling Texas Instruments Ultra Low-Power Chargers. 2017. Ramachandran/etal/2017a Ramachandran Venkatapathy, Aswin Karthik and Bayhan, Haci and Zeidler, Felix and ten Hompel, Michael. Human Machine Synergies in Intra-Logistics: Creating a Hybrid Network for Research and Technologies. In 5th Workshop on Information Technologies for Logistics, 2017. Tiemann/etal/2017a Janis Tiemann and Johannes Pillmann and Christian Wietfeld. Ultra-Wideband Antenna-Induced Error Prediction using Deep Learning on Channel Response Data. In IEEE Vehicular Technology Conference (VTC-Spring), Sydney, Australia, 2017. Tiemann/Wietfeld/2017a Tiemann, Janis and Wietfeld, Christian. 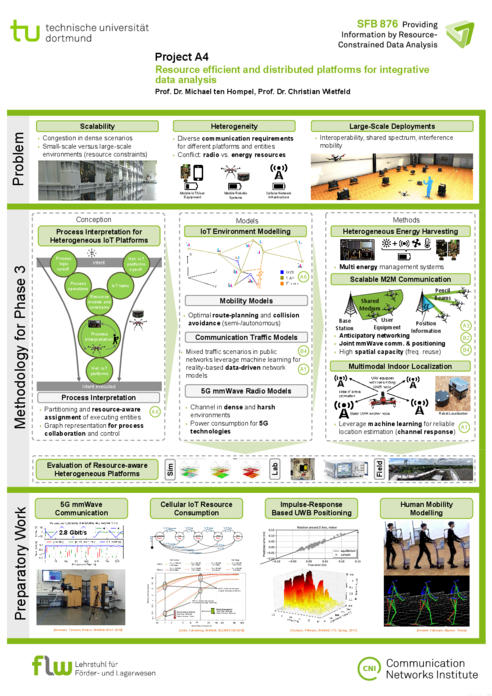 Scalable and Precise Multi-UAV Indoor Navigation using TDOA-based UWB Localization. In 2017 International Conference on Indoor Positioning and Indoor Navigation (IPIN), pages 1-7, Sapporo, Japan, 2017. Falkenberg/etal/2016a Robert Falkenberg and Christoph Ide and Christian Wietfeld. Client-Based Control Channel Analysis for Connectivity Estimation in LTE Networks. In IEEE Vehicular Technology Conference (VTC-Fall), IEEE, Montréal, Canada, 2016. Ide/etal/2016a Christoph Ide and Robert Falkenberg and Dennis Kaulbars and Christian Wietfeld. Empirical Analysis of the Impact of LTE Downlink Channel Indicators on the Uplink Connectivity. In IEEE Vehicular Technology Conference (VTC-Spring), IEEE, Nanjing, China, 2016. Ide/etal/2016b Christoph Ide and Oleg Belov and Dennis Kaulbars and Christian Wietfeld. BaLAnce: Battery Lifetime-Aware LTE Switching-Off Strategy in Green Network Infrastructures. In IEEE Vehicular Technology Conference (VTC-Fall), pages 1-6, Montréal, Canada, 2016. Masoudinejad/etal/2015b Masoudinejad, Mojtaba and Emmerich, Jan and Kossmann, Dominik and Riesner, Andreas and Roidl, Moritz and ten Hompel, Michael. 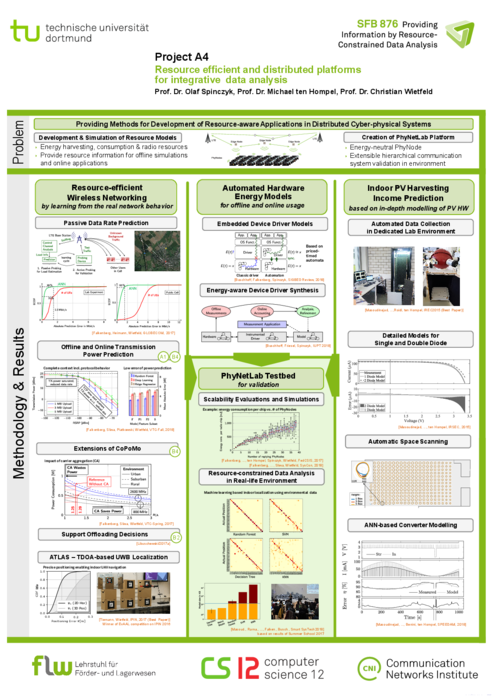 A Measurement Platform for Photovoltaic Performance Analysis in Environments with Ultra-Low Energy Harvesting Potential. In Sustainable Cities and Society, Vol. 25, pages 74 - 81, 2016. Masoudinejad/etal/2016a Masoudinejad, Mojtaba and Ramachandran Venkatapathy, Aswin Karthik and Emmerich, Jan and Riesner, Andreas. Smart Sensing Devices for Logistics Application. In Sensor Systems and Software, pages 41-52, Springer, 2016. Tiemann/etal/2016a Janis Tiemann and Johannes Pillmann and Stefan Böcker and Christian Wietfeld. Ultra-wideband Aided Precision Parking for Wireless Power Transfer to Electric Vehicles in Real Life Scenarios. In IEEE Vehicular Technology Conference (VTC-Fall), IEEE, Montréal, Canada, 2016. Tiemann/etal/2016b Janis Tiemann and Fabian Eckermann and Christian Wietfeld. Multi-User Interference and Wireless Clock Syncronization in TDOA-based UWB Localization. In 2016 International Conference on Indoor Positioning and Indoor Navigation (IPIN), Alcala de Henares, Madrid, Spain, 2016. Tiemann/etal/2016c Janis Tiemann and Fabian Eckermann and Christian Wietfeld. ATLAS - An Open-Source TDOA-based Ultra-Wideband Localization System. In 2016 International Conference on Indoor Positioning and Indoor Navigation (IPIN), Alcala de Henares, Madrid, Spain, 2016. Kaulbars/etal/2015a Kaulbars, D. and Schweikowski, F. and Wietfeld, C.. Spatially Distributed Traffic Generation for Stress Testing the Robustness of Mission-Critical Smart Grid Communication. In Accepted for presentation at IEEE GLOBECOM 2015 Workshop on SmartGrid Resilience, San Diego, USA, 2015. Masoudinejad/etal/2015a Masoudinejad, M. and Emmerich, J. and Kossmann, D. and Riesner, A. and Roidl, M. and ten Hompel, M.. Development of a measurement platform for indoor photovoltaic energy harvesting in materials handling applications. In IREC2015 The Sixth International Renewable Energy Congress, pages 1-6, 2015.
masoudinejad/etal/2015c Masoudinejad, Mojtaba and Kamat, Manjunath and Emmerich, Jan and ten Hompel, Michael. A Gray Box Modeling of a Photovoltaic Cell under Low Illumination in Materials Handling Application. In IEEE International Renewable and Sustainable Energy Conference (IRSEC), pages 1-6, 2015. Ramachandran/etal/2015b Ramachandran Venkatapathy, Aswin Karthik and Riesner, Andreas and Roidl, Moritz and Emmerich, Jan and ten Hompel, Michael. PhyNode: An intelligent, cyber-physical system with energy neutral operation for PhyNetLab. In Proceedings of the European Conference on Smart Objects, Systems and Technologies, Smart SysTech, 2015. Sbeiti/etal/2015a M. Sbeiti and N. Goddemeier and D. Behnke and C. Wietfeld. PASER: Secure and Efficient Routing Approach for Airborne Mesh Networks. In IEEE Transactions on Wireless Communications, Vol. PP, No. 99, pages 1-1, 2015. Tiemann/etal/2015a Tiemann, J. and Schweikowski, F. and Wietfeld, C.. Design of an UWB Indoor-Positioning System for UAV Navigation in GNSS-Denied Environments. In 2015 International Conference on Indoor Positioning and Indoor Navigation (IPIN), Banff, Canada, 2015. Venkatapathy/etal/2015a Ramachandran Venkatapathy, Aswin Karthik and Roidl, Moritz and Riesner, Andreas and Emmerich, Jan and ten Hompel, Michael. PhyNetLab: Architecture design of ultra-low power Wireless Sensor Network testbed. In IEEE 16th International Symposium on World of Wireless, Mobile and Multimedia Networks (WoWMoM), pages 1-6, 2015. Dusza/etal/2014a Dusza, Bjoern and Marwedel, Peter and Spinczyk, Olaf and Wietfeld, Christian. A Context-Aware Battery Lifetime Model for Carrier Aggregation Enabled LTE-A Systems. In Proc. of the IEEE Consumer Communications and Networking Conference, Las Vegas, USA, 2014. Libuschewski/etal/2014a Libuschewski, Pascal and Kaulbars, Dennis and Dusza, Björn and Siedhoff, Dominic and Weichert, Frank and Müller, Heinrich and Wietfeld, Christian and Marwedel, Peter. Multi-Objective Computation Offloading for Mobile Biosensors via LTE. In 4th International Conference on Wireless Mobile Communication and Healthcare (Mobihealth), 2014 EAI, pages 226-229, 2014. Roidl/etal/2014a Roidl, Moritz and Emmerich, Jan and Riesner, Andreas and Masoudinejad, Mojtaba and Kaulbars, Dennis and Ide, Christoph and Wietfeld, Christian and ten Hompel, Michael. Performance Availability Evaluation of Smart Devices in Materials Handling Systems. In accepted for IEEE ICCC Workshops on Internet of Things, Shanghai, China, 2014. Wietfeld/etal/2014a Wietfeld, Christian and Ide, Christoph and Dusza, Bjoern. Resource Efficient Mobile Communications for Crowd-Sensing. In Proceedings of 51st ACM/EDAC/IEEE Design Automation Conference (DAC), pages 1-6, San Francisco, USA, IEEE, 2014. Borchert/etal/2013a Borchert, Christoph and Schirmeier, Horst and Spinczyk, Olaf. Generative Software-based Memory Error Detection and Correction for Operating System Data Structures. In Proceedings of the 43nd IEEE/IFIP International Conference on Dependable Systems and Networks (DSN '13), IEEE Computer Society Press, 2013. Buschhoff/etal/2013a Buschhoff, Markus and Streicher, Jochen and Dusza, Björn and Wietfeld, Christian and Spinczyk, Olaf. MobiSIM: A Simulation Library for Resource Prediction of Smartphones and Wireless Sensor Networks. In Proceedings of the 46th Annual Simulation Symposium, Society for Computer Simulation International, 2013. Buschhoff/etal/2013b Buschhoff, Markus and Günter, Christian and Spinczyk, Olaf. MIMOSA, a Highly Sensitive and Accurate Power Measurement Technique for Low-Power Systems. In Real-World Wireless Sensor Networks, Springer, 2013. Dusza/etal/2013a Dusza, Bjoern and Ide, Christoph and Cheng, Liang and Wietfeld, Christian. An Accurate Measurement-Based Power Consumption Model for LTE Uplink Transmissions. In Proc. of IEEE INFOCOM (Poster), Turin, Italy, IEEE, 2013. Dusza/etal/2013b Dusza, Bjoern and Ide, Christoph and Boek, Patrick-Benjamin and Wietfeld, Christian. Optimized Cross-Layer Protocol Choices for LTE in High-Speed Vehicular Environments. In Proc. of the 9th IEEE International Wireless Communications and Mobile Computing Conference (IWCMC 2013), Cagliari, Italy, 2013. Dusza/etal/2013c Dusza, Bjoern and Ide, Christoph and Wietfeld, Christian. Quantitative Bewertung des Einflusses von Kontext- und Systemparametern auf die Batterie-Laufzeit von LTE Endgeräten. In Proc. of the 18th VDE/ITG Fachtagung Mobilkommunikation,, Osnabrück, Germany, VDE press, 2013. Dusza/etal/2013d Dusza, Bjoern and Ide, Christoph and Cheng, Liang and Wietfeld, Christian. CoPoMo: A Context-Aware Power Consumption Model for LTE User Equipment. In Transactions on Emerging Telecommunications Technologies (ETT), Vol. 24, No. 6, pages 615-632, Wiley, 2013.
erlinghagen/etal/2013a Erlinghagen, Katrin and Dusza, Bjoern and Wietfeld, Christian and Huschke, Jörg. Dynamic Cell Size Adaptation and Intercell Interference Coordination in LTE HetNets. In Proc. of the IEEE 78th Vehicular Technology Conference (VTC2013-Fall), Las Vegas, USA, 2013. Putzke/Wietfeld/2013a Putzke, Markus and Wietfeld, Christian. Self-Organizing Fractional Frequency Reuse for Femtocells Using Adaptive Frequency Hopping. In Proc. of the IEEE Wireless Communications and Networking Conference 2013 (WCNC), Shanghai, China, 2013. Rohde/etal/2012a Rohde, Sebastian and Putzke, Markus and Wietfeld, Christian. Ad Hoc Self-Healing of OFDMA Networks Using UAV-Based Relays. In Journal on Ad Hoc Networks (Elsevier), Vol. 11, No. 7, pages 1893-1906, 2013. Borchert/etal/2012a Borchert, Christoph and Lohmann, Daniel and Spinczyk, Olaf. CiAO/IP: A Highly Configurable Aspect-Oriented IP Stack. In Proceedings of the 10th international conference on Mobile systems, applications, and services, pages 435--448, New York, NY, USA, ACM, 2012. Buschhoff/etal/2012a Buschhoff, Markus and Günter, Christian and Spinczyk, Olaf. A unified approach for online and offline estimation of sensor platform energy consumption. In Wireless Communications and Mobile Computing Conference (IWCMC), 2012 8th International, pages 1154 -1158, IEEE, 2012. Dusza/etal/2012a Dusza, Björn and Ide, Christoph and Wietfeld, Christian. A Measurement Based Energy Model for IEEE 802.16e Mobile WiMAX Devices. In Proc. of the IEEE 75th Vehicular Technology Conference (VTC-Spring), Yokohama, Japan, IEEE, 2012. Dusza/etal/2012b Dusza, Björn and Ide, Christoph and Wietfeld, Christian. Interference Aware Throughput Measurements for Mobile WiMAX over Vehicular Radio Channels. In Proc. of the IEEE Wireless Communications and Networking Conference (WCNC) Workshop on Wireless Vehicular Communications and Networks (WVCN), Paris, France, IEEE, 2012. Dusza/etal/2012c Dusza, Bjoern and Ide, Christoph and Wietfeld, Christian. Utilizing Unused Network Capacity for Battery Lifetime Extension of LTE Devices. In Proc. of the IEEE International Conference on Communications (ICC), Ottawa, Canada, IEEE, 2012. Dusza/etal/2012d Dusza, Bjoern and Ide, Christoph and Wietfeld, Christian. Measuring the Impact of the Mobile Radio Channel on the Energy Efficiency of LTE User Equipments. In Proc. of the 21st International Conference on Computer Communication Networks (ICCCN), Munich, Germany, IEEE, 2012. Ide/etal/2012a Ide, Christoph and Dusza, Bjoern and Wietfeld, Christian. Energy Efficient LTE-Based Floating Car Data Collection for Dynamic Traffic Forecasts. In Proc. of the IEEE International Conference on Communications (ICC), Ottawa, Canada, IEEE, 2012. Ide/etal/2012b Ide, Christoph and Dusza, Bjoern and Putzke, Markus and Mueller, Christian and Wietfeld, Christian. Influence of M2M Communication on the Physical Resource Utilization of LTE. In Proc. of the 11th Wireless Telecommunications Symposium (WTS 2012), London, UK, IEEE, 2012. Ide/etal/2012c Ide, Christoph and Dusza, Bjoern and Putzke, Markus and Wietfeld, Christian. Channel Sensitive Transmission Scheme for V2I-based Floating Car Data Collection via LTE. In Proc. of IEEE International Conference on Communications (ICC), pages 7151-7156, Ottawa, Canada, IEEE, 2012. Ide/etal/2012e Ide, Christoph and Duzsa, Bjoern and Wietfeld, Christian. Performance Evaluation of V2I-Based Channel Aware Floating Car Data Transmission via LTE. In 15th International IEEE Conference on Intelligent Transportation Systems - ITSC, Anchorage, USA, IEEE, 2012. Kuhnert/etal/2012a Kuhnert, Maike and Tran, Thang and Wietfeld, Christian. Cost-Effective and Feasible Handoff Application for Mobile Phones. In Proc. of the IEEE 76th Vehicular Technology Conference (VTC-Fall), Québec City, Canada, IEEE, 2012. Lohmann/etal/2012a Daniel Lohmann and Olaf Spinczyk and Wanja Hofer and Wolfgang Schröder-Preikschat. The Aspect-Aware Design and Implementation of the CiAO Operating-System Family. In Gary T. Leavens and Shigeru Chiba and Michael Haupt and Klaus Ostermann and Eric Wohlstadter (editors), Transactions on AOSD IX, No. 7271, pages 168--215, Springer, 2012. ManningDahan/etal/2012a Manning-Dahan, Tyler and Putzke, Markus and Wietfeld, Christian. Measuring the Power Consumption of Smartphones. No. 3, TU Dortmund University, 2012. Putzke/Wietfeld/2012a Putzke, Markus and Wietfeld, Christian. Self-Organizing Ad Hoc Femtocells for Cell Outage Compensation Using Random Frequency Hopping. In 23rd IEEE International Symposium on Personal, Indoor and Mobile Radio Communications (PIMRC), 2012. Tran/etal/2012a Tran, Thang and Kuhnert, Maike and Wietfeld, Christian. Energy-efficient Handoff Decision Algorithms for CSH-MU Mobility Solution. In Proc. of the 21st International Conference on Computer Communication Networks (ICCCN), 2nd International Workshop on Context-aware QoS Provisioning and Management for Emerging Networks, Applications and Services (ContextQoS), Munich, Germany, IEEE, 2012. Meier/Spinczyk/2011a Meier, Matthias and Spinczyk, Olaf. LavA: Model-Driven Development of Configurable MPSoC Hardware Structures for Robots. In Workshop on Software Language Engineering for Cyber-physical Systems, 2011. Putzke/Wietfeld/2011a Putzke, Markus and Wietfeld, Christian. Self-Organizing OFDMA Systems by Random Frequency Hopping. In 4th. Wireless Days, IFIP, 2011. Borchert/2017a Christoph Borchert. Aspect-Oriented Technology for Dependable Operating Systems. TU Dortmund, 2017. Meier/2017a Matthias Meier. Co-Konfiguration von Hardware- und Systemsoftware-Produktlinien. TU Dortmund, 2017. Putzke/2015a Putzke, Markus. Selbstorganisierende Minimierung der Interferenz von Femtozellen in heterogenen Netzen durch zufällige Frequenzsprungverfahren. Technische Universität Dortmund, 2015. Dusza/2014a Dusza, Bjoern. Context-Aware Power Consumption Modeling for Energy Efficient Mobile Communication Services. Technische Universität Dortmund, 2014. Belov/2015a Belov, Oleg. Optimierung der Energiebilanz zwischen LTE-Endgeräten und Basisstationen. TU Dortmund, 2015. Haferkamp/2014a Haferkamp, Marcus. Messtechnische Analyse der verkehrsabhängigen Energieeffizienz von GPRS, UMTS und LTE. TU Dortmund, 2014. Erlinghagen/2013a Erlinghagen, Katrin. Cell Size Adaptation and Intercell Interference Coordination in LTE Heterogeneous Networks. TU Dortmund, 2013. Kaulbars/2013a Kaulbars, Dennis. Fair and Energy-Efficient Dynamic Scheduling for Heterogeneous Mobile Networks. TU Dortmund, 2013. Fromme/2012a Fromme, Christopher. Kontextsensitive Transmit Power Control Regelung für Long Term Evolution basierte Mobilfunksysteme. TU Dortmund, 2012. Kolanczyk/2012a Kolanczyk, Tim. Messtechnische Untersuchung von LTE-Systemen unter realistischen Kanalbedingungen. 2012. Sercan/2012a Sercan, Erdal. Messtechnische Validierung eines Energie-Modells für IEEE 802.16eMobile-WiMAX-Systeme. 2012. Fromme/2011a Fromme, Christopher. Messtechnische Untersuchung des Einflusses von Mobilfunkkanälen auf OFDM basierte Funksysteme. 2011. Lohmann/etal/2009a Daniel Lohmann and Wanja Hofer and Wolfgang Schröder-Preikschat and Jochen Streicher and Olaf Spinczyk. CiAO: An Aspect-Orientated Operating-System Family for Resource-Constrained Embedded Systems. In Proceedings of the 2009 USENIX Annual Technical Conference, pages 215--228, Berkeley, CA, USA, USENIX Association, 2009. Sincero/etal/2009a Julio Sincero and Wolfgang Schröder-Preikschat and Olaf Spinczyk. Towards Tool Support for the Configuration of Non-Functional Properties in SPLs. In Proceedings of the 42nd Hawai'i International Conference on System Sciences (HICSS '09), Waikoloa, Big Island, Hawaii, IEEE Computer Society Press, 2009. Timm/etal/2009a C. Timm and J. Schmutzler and P. Marwedel and C. Wietfeld. Dynamic Web Service Orchestration applied to the Device Profile for Web Services in Hierarchical Networks. In ICST/IEEE 4th International Conference on Communication System Software and Middleware, Trinity College Dublin, Ireland, 2009. Rosenmueller/etal/2008a Marko Rosenmüller and Norbert Siegmund and Horst Schirmeier and Julio Sincero and Sven Apel and Thomas Leich and Olaf Spinczyk and Gunter Saake. FAME-DBMS: Tailor-made Data Management Solutions for Embedded Systems. In Workshop on Software Engineering for Tailor-made Data Management, pages 1--6, School of Computer Science, University of Magdeburg, 2008. Schmutzler/etal/2008b J. Schmutzler and U. Bieker and C. Wietfeld. Network-centric Middleware supporting dynamic Web Service Deployment on heterogeneous Embedded Systems. In ICE 2008, 14th International Conference on Concurrent Enterprising, Lisboa, Portugal, 2008. Lohmann/etal/2007b Daniel Lohmann and Jochen Streicher and Wanja Hofer and Olaf Spinczyk and Wolfgang Schröder-Preikschat. Configurable Memory Protection by Aspects. In Proceedings of the 4th Workshop on Programming Languages and Operating Systems (PLOS '07), New York, NY, USA, ACM Press, 2007. Schirmeier/Spinczyk/2007a Horst Schirmeier and Olaf Spinczyk. Tailoring Infrastructure Software Product Lines by Static Application Analysis. In Proceedings of the 11th Software Product Line Conference (SPLC '07), pages 255--260, IEEE Computer, 2007. Spinczyk/Lohmann/2007a Olaf Spinczyk and Daniel Lohmann. The Design and Implementation of AspectC++. In Knowledge-Based Systems, Special Issue on Techniques to Produce Intelligent Secure Software, Vol. 20, No. 7, pages 636--651, Elsevier North-Holland, Inc., 2007. Spinczyk/Papajewski/2007a Olaf Spinczyk and Holger Papajewski. Using Feature Models for Product Derivation. In Proceedings of the 11th Software Product Line Conference (SPLC '07), pages 5--6, Kyoto, Japan, 2007. Yousaf/etal/2007a F. Z. Yousaf and K. Daniel and C. Wietfeld. Performance Evaluation of IEEE 802.16 WiMAX Links With Respect to Higher Layer Protocols. In IEEE International Symposium for Wireless Communication Systems, Trondheim, 2007. Lohmann/etal/2006a Daniel Lohmann and Fabian Scheler and Reinhard Tartler and Olaf Spinczyk and Wolfgang Schröder-Preikschat. A Quantitative Analysis of Aspects in the eCos Kernel. In Proceedings of the EuroSys 2006 Conference (EuroSys '06), pages 191--204, New York, NY, USA, ACM Press, 2006. Lohmann/etal/2006b Daniel Lohmann and Olaf Spinczyk and Wolfgang Schröder-Preikschat. Lean and Efficient System Software Product Lines: Where Aspects Beat Objects. In Awais Rashid and Mehmet Aksit (editors), Transactions on AOSD II, No. 4242, pages 227--255, Springer, 2006.